grandma's cookie jar: I Have A Winner & the American Girl Doll Giveaway Tomorrow! 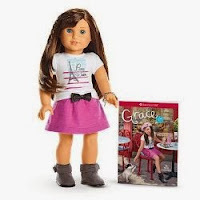 I Have A Winner & the American Girl Doll Giveaway Tomorrow! I'm very happy to say Nita VanHoy Carter is the winner of the books Sleepy Puppy and Sleepy Kitty - from Sterling Children's Books. (You'll find my full review at this link.) Thank you Nita for reading grandma's cookie jar (please email me your address by May 30, 2015, so I can send them to you - lyndagcj@gmail.com) and thank you Sterling Children's Books for sending one for me to review and for making another available for me to give away! Tomorrow, on May 24, 2015 I'm giving away one American Girl Doll and Paperback Book - Grace, the 2015 Girl of the Year Doll. Yes! The day has finally almost arrived for me to give the doll away! You will find all the details for the give-away at this link - but the important thing is you still have time to enter the drawing for this lovely doll - who knows???!!! Maybe you will win! Can't wait, good luck everyone !